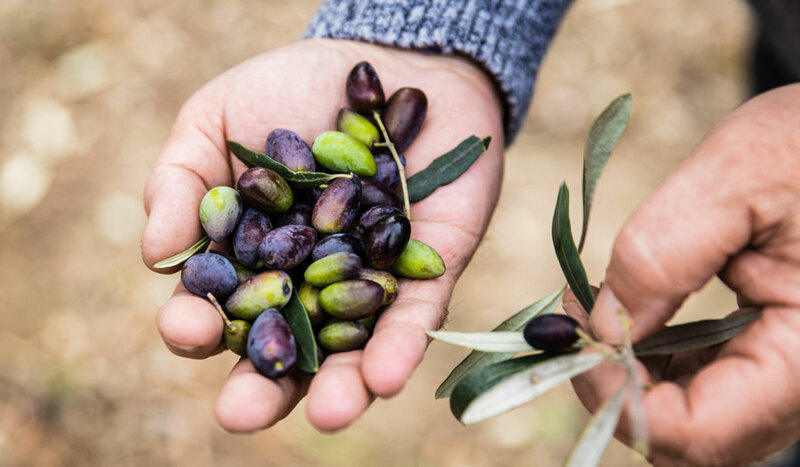 See for yourself the story behind our olive grove, the making of our olive oil and my own olive curing and roasting: click here. With special thanks to our talented and generous filmmaking friend Andrew Beck. In a couple of months, you’ll be thanking yourself for taking the time to make these. First, take some freshly picked kalamatas and with a sharp knife make a shallow cut lengthways along each one. Place all the cut olives in a clean bucket of water and change this water every day for five days. The olives will now be ready to jar up. Preheat the oven to 180°C. Now make up the brine that with time will cure your olives. To 1 litre of water add 100 grams of salt. Bring to a boil. Allow to cool for 5 minutes. Next, sterilize your (sealable) jars. Wash with warm soapy water, rinse well and place in the hot oven. Remove once dry – about 10 minutes. Into your sterilized jars, add a rosemary stalk, the rind from a quarter of a lemon and, if you like, a sprinkling of peppercorns. Now, fill up your delicious-looking jars with your olives and top with your brine, which should just cover the olives. Then seal, leave for three months and be patient! After three months, test. If the kalamatas are still bitter, they just need more time. Leave for another month and try again. Repeat until the flavour is just right. Don’t worry. You’ll know when this is. To serve your olives, take from the jar what you need, place in a colander and rinse off the brine. Drain well. Then, in a bowl, dress them with your best-quality extra virgin olive oil and, my tip, a drizzle of balsamic vinegar. I think these marinated kalamatas can be served with just about anything, whether a picnic lunch or a sumptuous feast. If you’d like an olive recipe that is super simple and gratifyingly fast, you’ll love this one. First, take some freshly picked manzanillos and with a sharp knife make a shallow cut lengthways along each side. Lay in a deep tray – a roasting tray would be ideal – and sprinkle with coarse salt. For every 500 grams of olives, use approximately 100 grams of salt. Stir every day for five to seven days. On day three, top up with extra salt. On day five, test! Choose an olive and rinse off the salt. If it still tastes bitter, allow to cure for another day and test again. When the taste is to your liking, rinse well and place on a baking tray. Now roast at 50°C for four to five hours or even overnight. Allow to cool, place in sterilized sealable jars, drizzle with olive oil and store in the pantry. To keep fresh, shake daily. Once opened, keep in the fridge. I like to serve these with pizzaiola, cacciatore or, when its warmer, a simple fennel and orange salad. Delizioso!